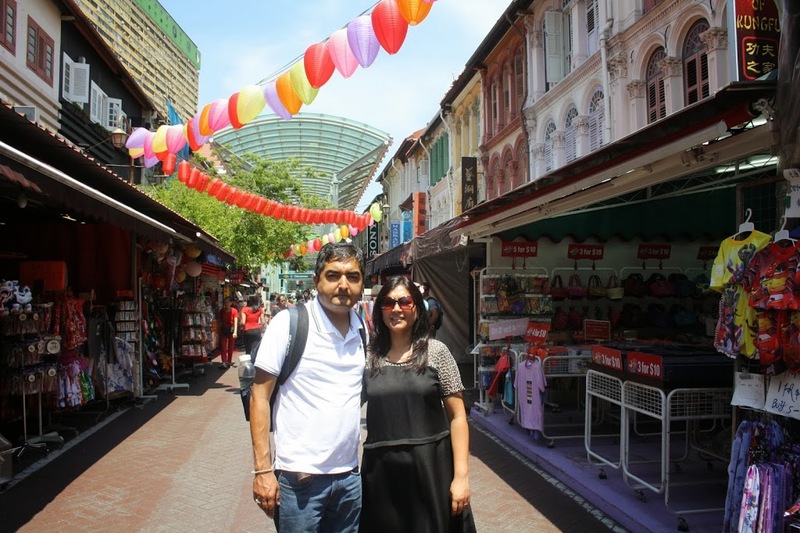 Today we wanted to get the Local Flavour of Singapore with visit to China Town and Little India. Take MRT from Harbour Front to China town ( N E Line). 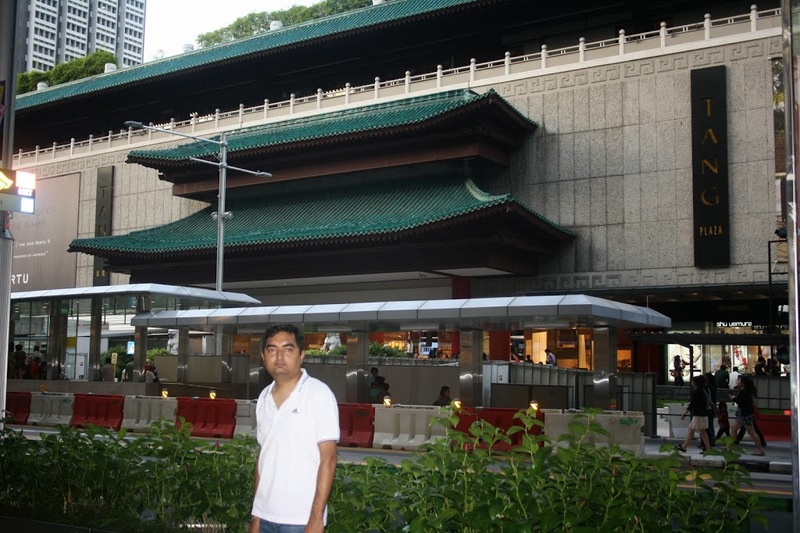 Visit China Town, Pagoda Street ,Buddha Tooth Relic Temple, Pinnacle@Duxton Skybridge, Singapore City Gallery. Can have food there at Maxwell Food Court. 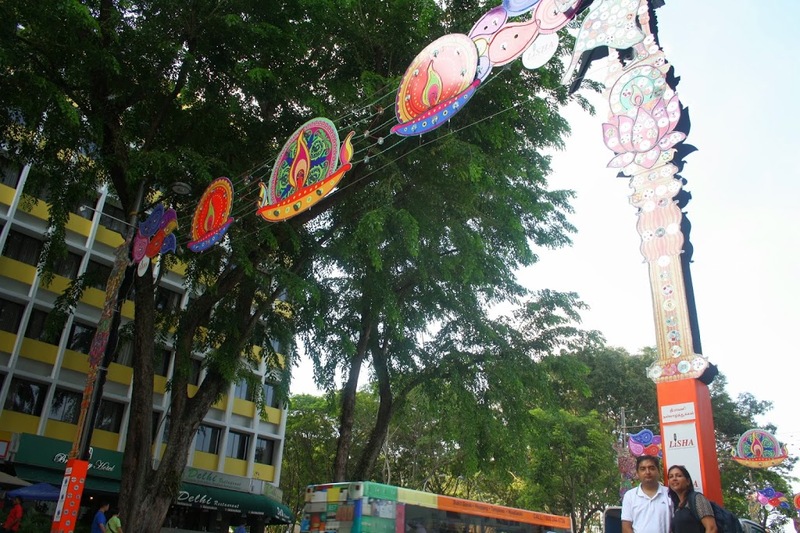 Or alternatively at Little India. Take MRT to Little India. 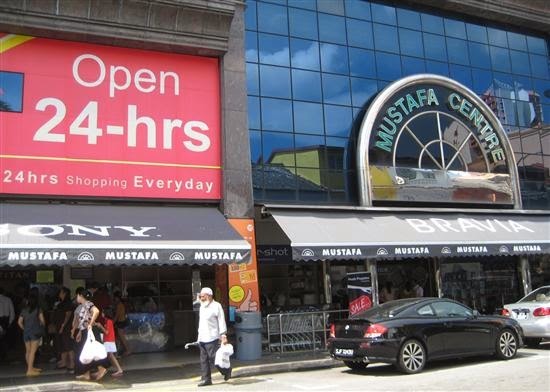 Or since Vivo City has been visited, can visit Mustafa centre there. For Food : Maxwell Food Centre located at 1 Kadayanallur Street. Recommended food stall is Tian Tian Hainanese Chicken Rice at unit No #01-10/11 located in Maxwell Food Centre. Chicken rice is one of Singapore’s most famous dishes and features steamed chicken accompanied by rice cooked in chicken stock. It is served with cucumber slices, minced ginger, chilli sauce and dark soy sauce. Sample the Maxwell Food Court for Chinese fritters and Chendol (a traditional ice cream made of flavoured crushed ice topped with fruits and boiled sweet corn at times). But as discussed in Previous blog posts, Since the Navratra Days ( Auspicious Nine Nights) were on, we were to have vegetarian food only. So Vikas Suggested that by Lunch time since we will be in Little India ( Mustafa Center to be precise) we can have South Indian food at Sarvanan Bhawan ( Across the road of Mustafa Center). Their Kara Dosa is very tasty. 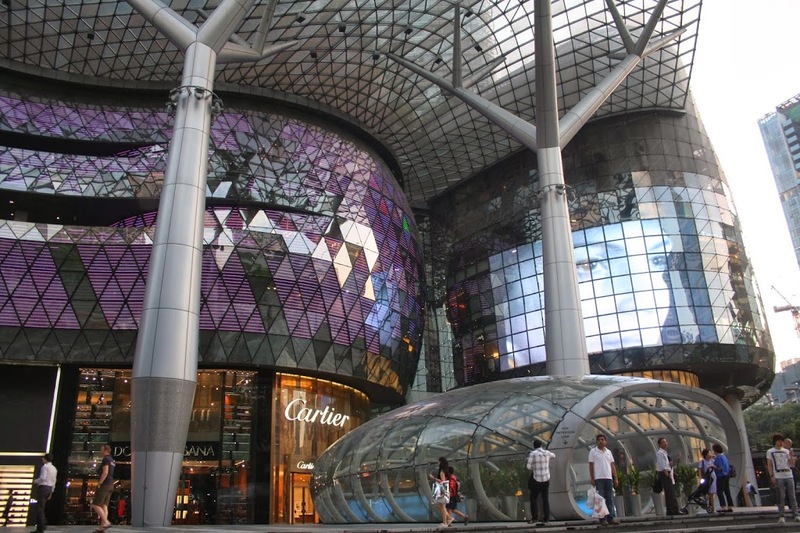 Also we were of the opinion that since Orchard road is also near we can visit there. 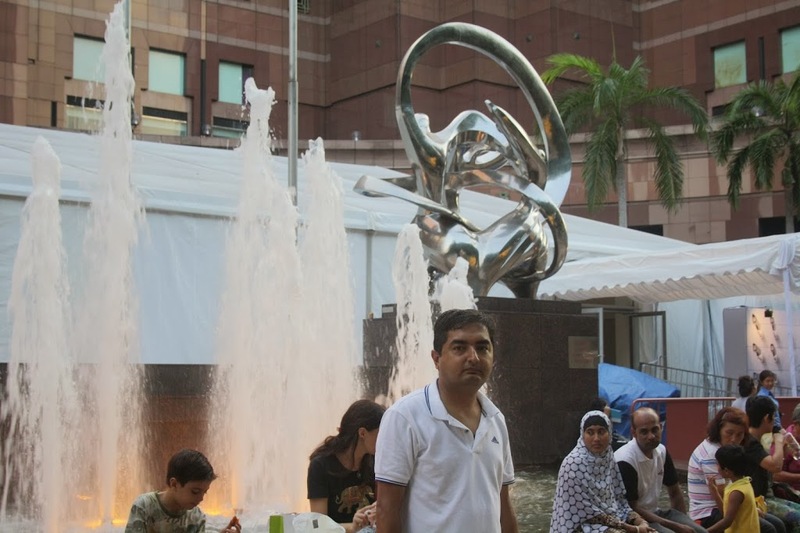 Orchard road is the Hep and Happening road for Singaporeans. 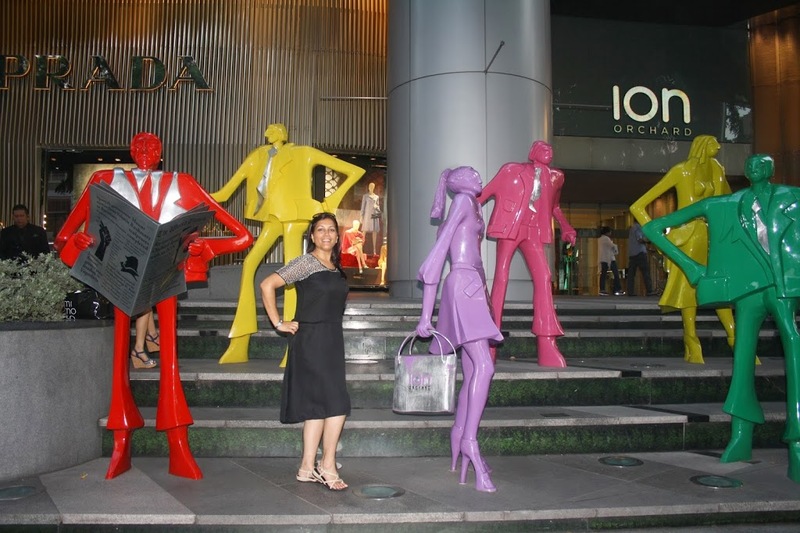 It has various Malls and luxury brands showrooms all lined up across the road. 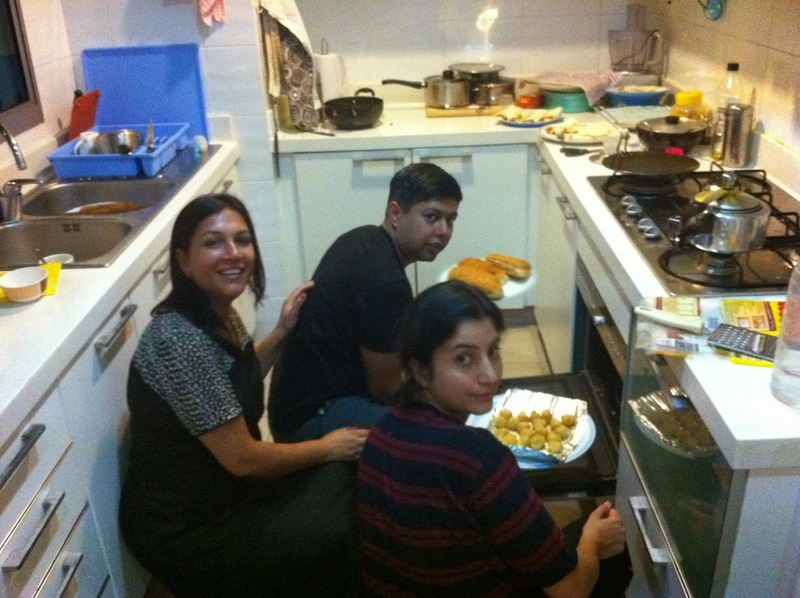 Also Vikas wanted to have dinner together so we were to return by 7 PM. We took the MRT from Harbour Front to China town ( N E Line). It was time for some souvenir shopping. So bought the staple Key Chains , fridge magnets etc.You get good deals as three for sng $ 10 or 5 for Sng $ 10, or 7 for sng $ 20, depending on quality and type. We went to other places also later, but I think this was cheapest area. There were T shirts for Sng $ 10 each, but we decided not to take due to quality. One of the cutest item I bought was a watch as a finger ring, instead of normal around the wrist type for my niece. 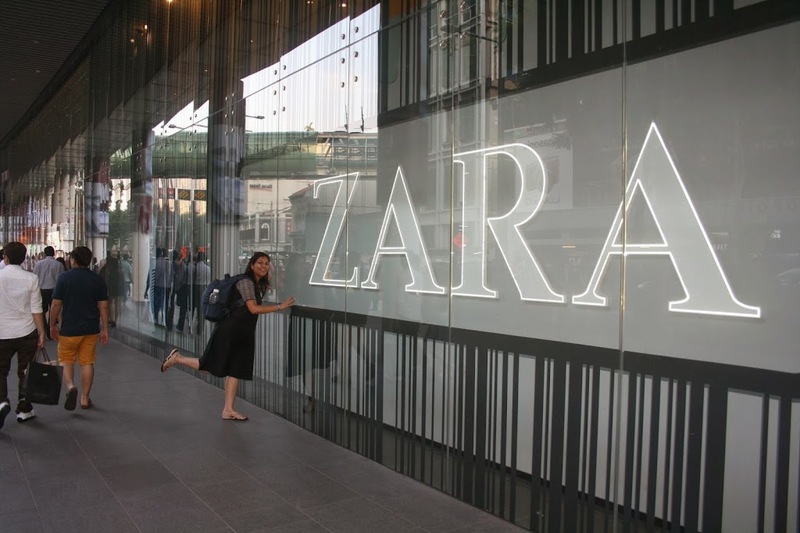 Also since we had done a lot of shopping from Kuala Lumpur being cheaper, we did not do much shopping here. We did a bit of sight seeing there, but not much as written in the original plan. We decided to leave for Little India. Thoguh on our way back we stumbled upon some more shops where we purchased more gift items. 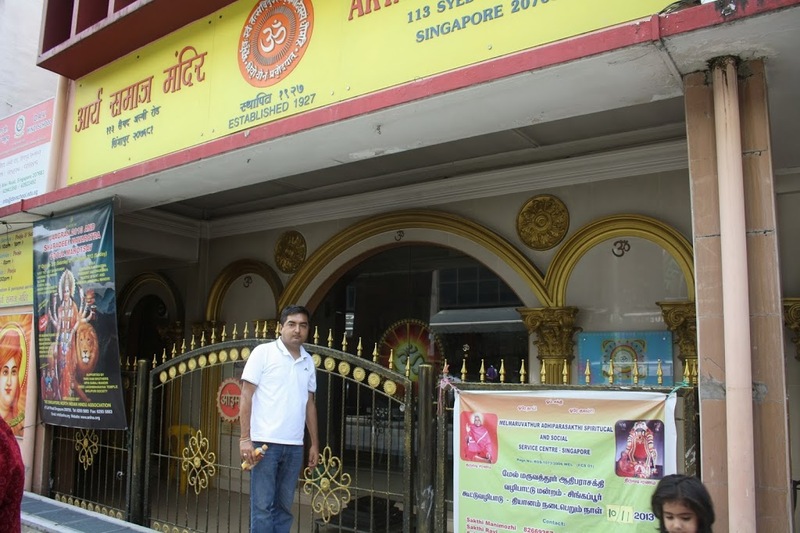 And as Vikas has told to take MRT till Ferrer road instead of Little India, we took NE line to Ferrer road. Walking for 2-3 mins we were in front of the famous Mustafa Center in Singapore. Its a 24 hrs open shopping center with everything you can think of normally. Its huge and crowded and is a maze to get lost in.It even has a currency changing counter ( Legal) and is normally cheaper than other places. There were good collection of Toys, but more or less these are available in India too, so we just bought two small toy cars. However the Microsoft X box censor, which was so fondly demanded by my nephew, we got is Rs 2000/- cheaper than India, it was approx Rs 8700/- or something, i don’t remember exactly. We bought some good quality Souvenir T shirts only slightly higher than China Town rates, but far superior in quality. Bought chocolates and souvenir Shot glasses too. 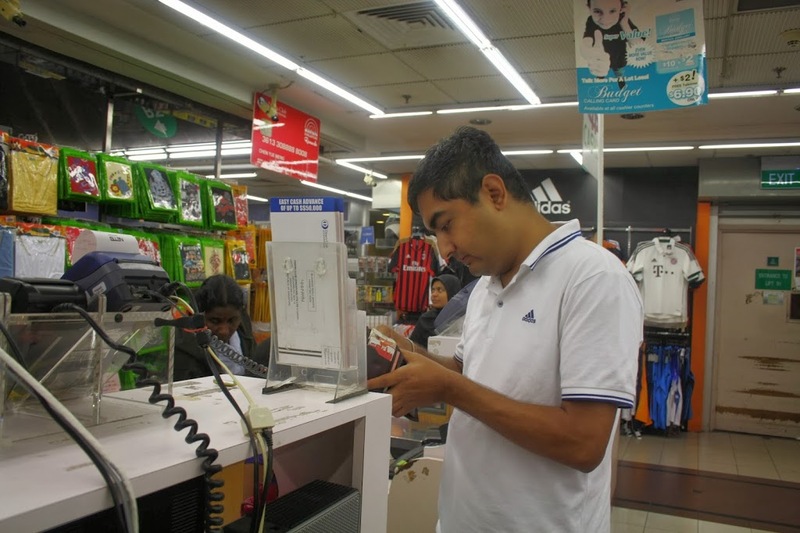 But one thing all shoppers to note is , that do carry your Passport to Mustafa, if you wish to have GST invoice thing done. As they refused to do for us without Passport, and we had to go again to do that ( unnecessary hassle). There in Mustafa, you get very nice Plastic Table covers for your Dining tables in Running meters instead of cut size. There were very pretty net/ lace designs, We didn’t buy as we were doubtful of their durability. Infact on our flight back I noticed someone who was carrying similar one, I had seen there. Later after coming back to India, my sister in law told they are very durable and classy as compared to others, so we were regretting we should have taken them. Sarvanan Bhawan to our dismay was not as big as we thought, but was good enough and clean. However you could feel the difference of cleanliness standards in other Parts of Singapore than in Little India. The Kara Dosa was superb and so was Rava Dosa. But the Waiter was quite Khadoos ( I don’t know the exact English word for this). Also unlike Punjab ( A north Indian state) where you are so used to of free second servings of curries ( in Chana Bhatura ( Chick peas with Indian bread) shops or sambhar at South Indian Shops), this chap was quite reluctant types. I think any one who goes there will meet him, as there was only one waiter in a Brown Safari suit. At times he seemed like owner so I don’t know who exactly he was. Nevertheless, the Kara Dosa was superb and unlike a routine Dosa. Thanks to Vikas for his expert tips. From there we and My Husband’s friend and family separated, as they were to meet some of his acquaintance. We took MRT From Ferrer Road to Orchard Road. As we were going towards the main Orchard road, we crossed the President’s palace. Unlike London’s Prime ministerial Guards at 10 Downing Street, here the men in uniform are reluctant for photographs of them. 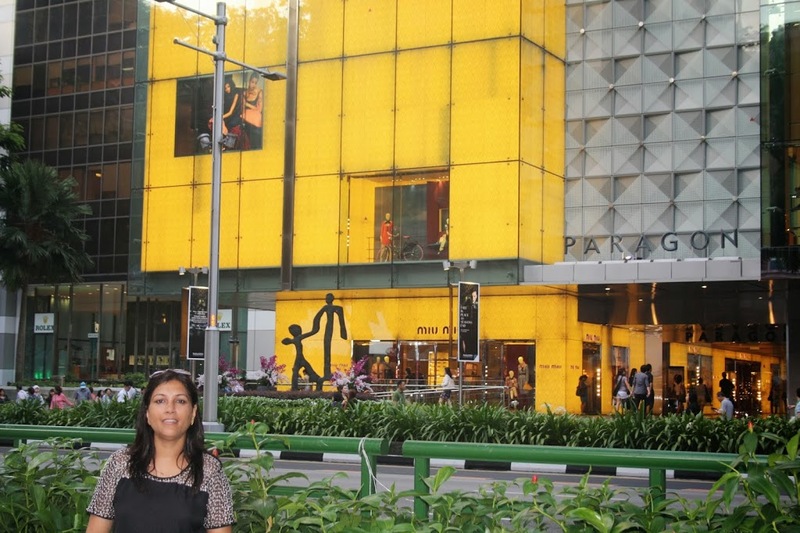 So with only the Palace in background of our Pics we moved towards the Orchard road. It was bustling with young crowd. However unlike Indian Youth, they talk in normal tones and are subdued ( or shall I say less loud). 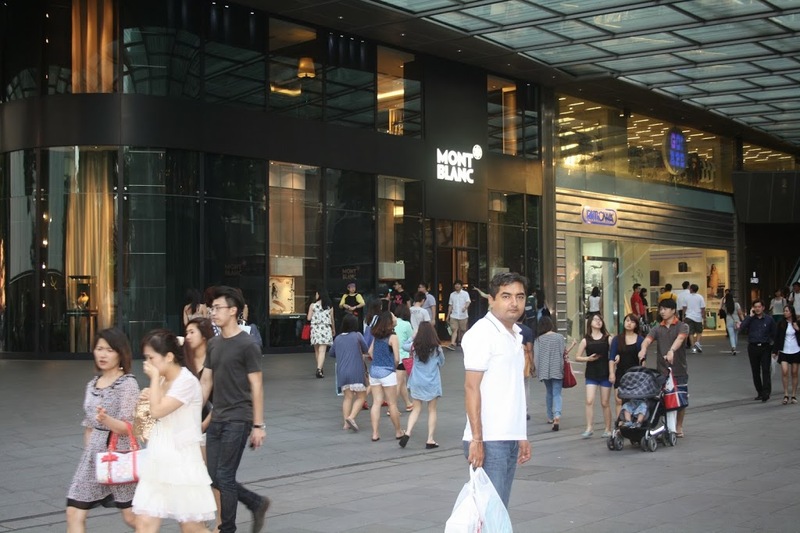 The Lane was full of designer showrooms Luxury Malls, where only the Dad’s rich Son or Daughters shop. So it was time for us to just see and feel good. Finally it was time to leave the materialistic world and retreat to home sweet home. Vikas and Niti were waiting. The aroma of Pizza and Garlic Bread was absolute delight as we entered the house. Cheese balls and Tortillas were mouth watering, as Preparations were full to for a Pool Side Party. 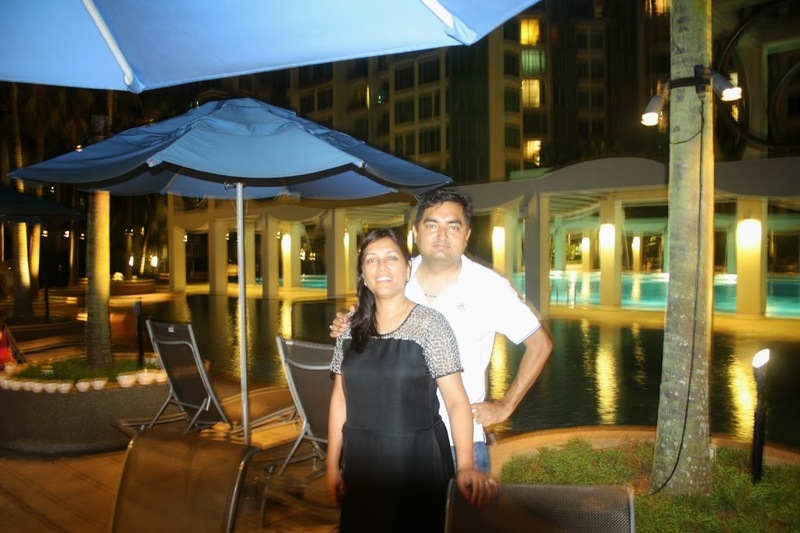 Vikas’s Condo has three swimming pools alongside which you can organize your get together After a great day it was time to rejoice for togetherness and friends revisited. It was fun time specially for the Kids who were running all over the place to enjoy! We enjoyed reflecting on life , the journey of Life so far and raising a toast to friendship!